I heart my Joemo XL! 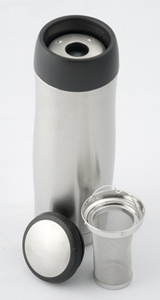 Very few products inspire me to <3, but I have to say that I really really do love my travel mug. The day’s weather struck me as a particularly nasty example of lousy New York rain. As the fall ushers out the summer, the temperature bounces up and down, and the flu starts to go around, I always make it a point to lug great coffee or tea with me. Thus, enter the Joemo XL! Keeps liquids pretty hot for a while, almost the same (unscientific) temperature range for 6 hours! Tea strainer is handy and removable as you need it. Slim profile makes it easy to carry in a bag. Single-button sip-from-anywhere top is convenient! Carrying tote isn’t conducive towards convenient access to the mug, especially if strapped to a bag. Difficult to clean and requires a good scrubbing and soak to prevent stains. Since the silicone gaskets need TLC and inspection every so often to ensure a good seal, perhaps offer a set of spares in the package and show some more details about care and longevity. Make a better (optional?) carrying tote that has a handle or integrates better with bags. Yay for (full?) Google Docs on Android! A consultant always packs light and travels right!